Gender Opportunity Opportunità di Genere: Sign it, sign it! 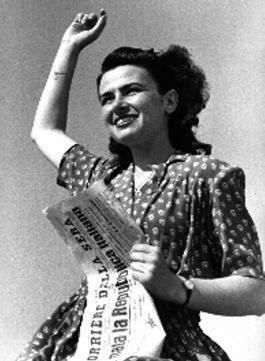 a young Italian Women glad to have vote for the first time in 1946. We are in December and the end of the year is near so we can do a final report of the campaigns undertaken in Italy, certainly the one to elect March 10th as a national holiday to celebrate the Women's vote in 1946 is among the most significant that there was even if it is passed mostly unnoticed in the main media. The petition, born to elect this date as "National day of Women's vote", has been thought by important Italian Women who have always dealt with these issues from different point of view such as Silvia Costa, Fiorenza Taricone, Roberta Agostini and Livia Turco President of the most important Foundation dedicated to an extraordinary Italian politician: Nilde Iotti, mother of the Italian Republic. Precisely this Foundation supported the initiative launching a petition on the well-known Change.org website. The Petition was addressed to the President of the Italian Republic: Sergio Mattarella, to the nowadays former Prime Minister Matteo Renzi, to the Minister for Equal Opportunity: Elena Maria Boschi and to the major Italian Institutions as Laura Boldrini the former Chief of the Italian Chamber of Deputies. This exact day, 10th of March, was choosen because it was right the day when for the first time the Italian Women voted and the promoters have choosen it "as emblematic moment to continue to explore the theme of civil and political rights for Men and Women". In few days the petition got more than 400 signatures and was presented to the Italian Chamber of Deputies to be argued. Right after the Nilde Iotti Foundation organized a Conference in Mestre to celebrate the 70th anniversary of the Italian vote of Women, held by the President of the Foundation, Livia Turco. In this same period some books were pubblished that retrace that issue such as "Laws of women who have changed Italy" and "Milestones and content of legislative achievements - from the beginning of the Republic to the end of the last legislature- that have changed the lives of Women and the economic, social and cultural development of our Country ". Unfortunately the current Italian Political situation does not leave hope that the suggestion would be considered in a short time.